April 02, 2007, 09:30:56 am by admin. With an 8 game lead and about 8 games left, it will take a collapse never seen before to blow this one. While the Padres certainly know late-season failure, we are pretty sure it's time to pop the corks! March 26, 2007, 08:55:28 pm by admin. 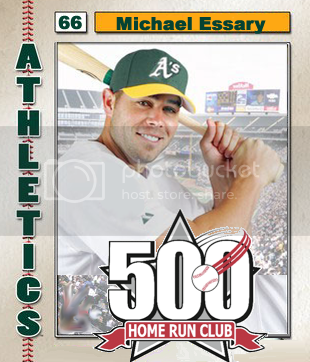 OAKLAND - Michael Essary got a standing ovation from 10,122 fans in Oakland, who witnessed his historic 500th career homerun. In the 1st inning he unloaded his 500th blast off Bill Parise. Perhaps his best year so far was 2027 where he hit .276 with 57 homeruns and 132 RBI. Michael has hit 40+ homeruns in a season 9 times. 'I guess I'll celebrate a bit today. But the most important thing is winning, and my whole career I gave everything I could to help my team.' The Hall of Fame already has reserved a place for this great player. March 26, 2007, 08:48:26 pm by admin. The American League Batter of the Month award goes to Taylor Breen, Orlando's starting designated hitter. In 95 at bats he hit .368 with 11 HR and 36 RBI. His season numbers are: .333 AVG, 170 hits, 38 doubles, 3 triples and 48 bombs, along with 148 RBI and 107 runs scored. He's 10th in the American League in batting, 2nd in homeruns and 1st in RBI! March 26, 2007, 08:42:57 pm by admin. Moises Ellison couldn't have pitched much better than he did in August, and the American League thought so as well, naming the right-hander Pitcher of the Month. He went 7-0 in August and finished the month with an ERA of 0.91. He struck out 61 in 49.1 innings. Moises has a record of 21-6 this season, with an ERA of 2.77. In 192 Innings he was able to strike out 208 batters. He has one complete game and one shutout. He's 3rd in the American League in ERA and 2nd in wins! March 17, 2007, 11:45:30 am by admin. MINNESOTA -- Jon Gust waited years for his chance to be on a major league team, and he's ready to start at the highest level. The Minnesota Twins introduced their new manager Sunday night at a news conference at Gate 31 of the Kansas City International Airport, and Jon Gust was asked if his lack of managerial experience at any level was a concern. March 17, 2007, 11:43:14 am by admin. MINNESOTA - Otis Franko got a standing ovation from 20867 fans in Minnesota, who witnessed his 3000th career hit. In 16 years of big league action so far, Otis has compiled a batting average of .320, along with 467 homeruns and 1617 RBI. 'My firends always told me that I will do it one day. I never believed it. Good that I was wrong!' His hit in the 2nd inning was a single off Ovidio Barrera. It's no secret that he will one day be in the Hall of Fame! March 14, 2007, 03:56:06 pm by admin. Hall of Famer and current Pittsburgh Pirates Manager Wilson Betemit surprisingly announced his retirement Friday, ending a 29-year big-league career that included stints with the Braves, Mariners, Padres, Rockies, Diamondbacks, Voodoo, and Pirates. He informed his agent, Jason Hasbard, of his decision to retire at the conclusion of the 2030 season this week, and, after sleeping on it for a few days, called general manager Jeff Knecht with the news Thursday afternoon.